So, this dip is what I mistook for whipped cream the other night. Yes, I brought this to sandwich between layers of strawberry shortcake and strawberries. In my defense, it didn’t have the garnishes in it yet – it was just white. But trust me, it’s much better served with crackers than with chocolate sauce. This is a great recipe to have in your repetoire because it has few ingredients and takes next to no time. It also tastes really good and can be made one day ahead. It’s a lovely place to put all those gorgeous radishes you are seeing at the farmer’s markets. Martha tells you to make your own pita chips here but I simply ran out of time. I brought my clients store-bought pita chips instead. Another change I made was to use more yogurt (a full 7 oz. container instead of the 1/4 cup she called for) to eliminate the need for olive oil in the spread. Tee hee. You’re funny. This dip looks delish! Great idea for this coming Summer…looks very refreshing with the radish in it. Yummie! Great pictures! I love radishes, but I never really use them. I can never think of how to use them in anything besides a salad. Thanks for this idea. Looks great! Yaey I was looking forward to this post! You seriously need to just stop posting or something though because I have saved way too many of the recipes you’ve posted and my list of “things to make” is getting infinitely longer! I also had to save the feta and ricotta skillet cheese pie. 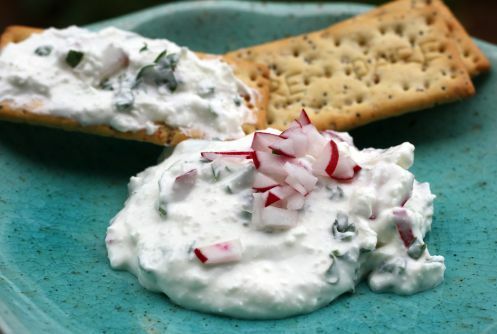 Feta radish spread. I am sold on the radish in there. That sounds great! And, I may be getting more radishes in my CSA today. Just in time. I just discovered sheep’s milk feta and Greek yogurt recently, and it’s been a yummy relationship so far. This looks like a great use for the two. I don’t use radishes much, mainly because I haven’t known what to do with them. I will look for these at the farmer’s market this weekend. Thank goodness this never made it into the strawberry dessert. The more yoghurt the better. Yum! Just stopping by to say hello! 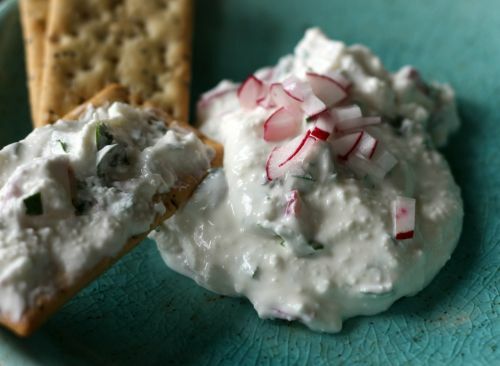 I made this delicious and easy dip this morning so I’d have something yummy and healthy to snack on today. Thanks for the recipe!